The Dragon Betting Baccarat system launched a couple of months ago has been very successful. Customers have been reporting their winnings both in the discussion forum and in private emails. There have been requests and inquiries to find out if this kind of system could be used to take advantage of the Panda side bets as well, paying 25 to 1. Yes, absolutely. And this new system Panda Betting EZ Baccarat System does exactly that. It's a counterpart of the Dragon Betting, except that this time it takes advantage of the Panda side bets in EZ Baccarat. The betting method is quite different though. Exactly the same strategy as the Dragon system could not be applied, due to the fact that Pandas are more frequent and we could take advantage of gaining profits out of multiple pandas showing up within the same shoe, as opposed to quitting the shoe or rather half shoe the moment the very first Dragon appears. In fact, there is a number of 3 Pandas per shoe in average. At times, you could have 7 Pandas in a shoe and very rarely no Pandas at all. Extensive tests have been conducted using this new strategy. The simulation shows again steadily rising profits the more the system is used. Also all shoes tested and photographed for the Dragon system (more than 150 of them) have shown to have created profits using this new strategy. So, it's another win-win system. The simulation has 834 random shoes, that show results for every single decision, that is every hand of every shoe. Why 834? Well, simply because the simulation is in MS-Excel and the spreadsheet can hold a maximum of 65,536 rows, where 834 shoes fit in up to the last 11 lines. The last 11 lines are utilized to show end result statistics, such as the number of Pandas, Player, Banker, Tie Decisions, average number of Pandas per shoe, the frequency of Pandas, etc. A parameter also enables to set different loss limits for various end profit results. The optimized value is 75, which is going to be your session bankroll. Should a shoe have no Pandas at all, that's the most you could lose. Statistically, the chances of this happening is one in 10. So, if you lose 75 units once every 10 shoe and gain between 10 and 25 units per shoe, you are in very good shape for long term profits. The simulation can be run as many times as you press F9, that is, indefinitely, and it will show profits of a few thousand units for the 834 shoes. In fact, after running it over 100 times, an average profit of 1500 units have been established for the 834 shoes, which gives you an average profit of 1500/834 = 1.8 units per shoe very consistently. This may not seem much, but, since the system is flat betting, you can use large unit denominations, such as $100 or $250 or whatever your budget allows. At $100, you can make $180 per shoe or per hour. You will be playing less than an hour, as you will not have to sit throughout the entire shoe all the time. If you play 5-6 shoes a day, this will amount to a profit of $1000 a day. At $250 a unit size, you can make up to $2500 a day, which is quite decent. 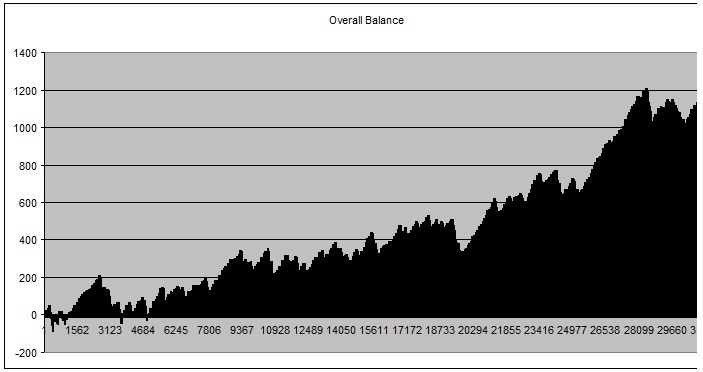 As you can see, with very little drawdown, the system generates profits with constantly new peeks continuously. So, the more you use the system, the more you will profit. You may occasionally encounter a small drawdown of about 160 units, during the initial stages of the system usage, then it will do a strong come back and your profits will never stop rising. That also means that a lifetime bankroll of 200 units will be quite ample to use this system most efficiently. If you already own the Dragon Betting Baccarat system, you can even use this system in conjunction with it profiting on all side bets offered, using a different bet method for each side bet. Upon your request I will give you the proper guidelines on how to do so. The system document is 39 pages of easy reading. You will understand exactly what you need to do to use the system to its utmost. 39 pages are longer than usual, but that's because the system document provides you examples with all possible scenarios without missing any one. This system will go for half price of the Dragon Betting system for $500 and it's worth every penny, as it generates continuous profits. Within the first or second day of the usage of the system it will pay itself off. Early bird purchasers can have a 80% discount again, if you purchase it by the end of August 2016. Yes, you can have it for $100 only. Your satisfaction is guaranteed, if you not you can ask for your money back within 30 days of your purchase, no strings attached and no questions asked. For $15 extra, you can have a printout shipped to your mailing address.